Click on Contact Us anf fill in the Form. This 128th issue of Practical Welding Letter opens with a report on an interesting EWI development. It consists in a new Matrix Phased Array ultrasonic testing probe, built especially for testing nondestructively resistance spot welds with special requirements. The manual probe coupled through special software with a proprietary screen viewer, permitted real time evaluation of individual spots C-scan representing a remarkable achievement. Next comes the interesting analysis reported from the Welding Journal, made by Damian J. Kotecki, of a problem concerning welding together of precipitation hardenable stainless steels. The study teaches the correct way of analyzing the consequences of a heat treatment for a given steel, welded to another one, responding differently to a specific thermal cycle. The lesson is that the requirement to mix the steels for economic reasons brings about some loss of properties that must be taken care of in the design stage of the project. In the Filler Metals section, several lists of Specifications are reported, that may be needed in certain occasions, as readers certainly know from their past experience. Additive manufacturing is a hot technology being actively pursued by many companies and institutions for their promise of consistent gains if compared to classic fabrication methods. In Section 7 two recent articles are summarized showing developments and achievements. Innovation is not easy, taking time and ingenuity to succeed, but once results meet expectancy, gains are projected to be formidable. Advances in Industrial Heat Treating is the title of the note in Section 11. It reports on two articles from a recent publication readily downloadable from ASM International. The first one studies the influence of strong magnetic fields on induction coupled heat treatments. It reports that the application of a high magnetic field on an AISI 1045 carbon steel shifts all phase equilibria. The discovery of this influence provides benefits deriving from the opportunity to exploit magnetic fields to obtain improved materials properties. The other article reports on advanced ways to control online common heat treatments, by combining advanced mathematical models and manufacturing data together with heat treating knowledge, synthesized with physics and data-based modeling approaches to generate insight for process optimization. This novel approach has been practically applied to a number of reported cases, improving economics, productivity and quality. Section (8) reports on new and revised website pages, readily available to all readers. It is hoped that most of readers will find some useful information at least in part of this publication. Titles of Articles from Practical Welding Letters can be found in the Welding Topics page. Links to the PWL complete list is available from the Index of Past Issues of PWL. The last Mid Month Bulletin on Resources on Submerged Arc Welding Electrode Extension was not distributed by e-mail, but it is available to all at Bulletin 94. An article published at page 22 of the March 2014 issue of Applied Materials and Processes (AM&P), an ASM International publication, reports on work performed at the Edison Welding Institute (EWI) of Columbus, Ohio. It consists in Matrix Phased Array (MPA) probes built to perform Ultrasonic Nondestructive Inspection of Resistance Spot Welds (RSW) used to build car bodies made in Advanced High Strength Steels (AHSS). New and more accurate tests are needed for these steels than for more traditional and lower strength steels, because AHSS shows different failure modes, particularly interfacial failures, due to the stress state and fracture toughness at the weld, presence of pores, cracks and embrittled regions. The article states that current testing practices used in aerospace and power generation are not readily transferable to the automotive industry due to fundamental differences. Probe development started with computational modeling and simulation using commercially available software. Then a handheld probe operating at 12 MHz frequency was designed and built. 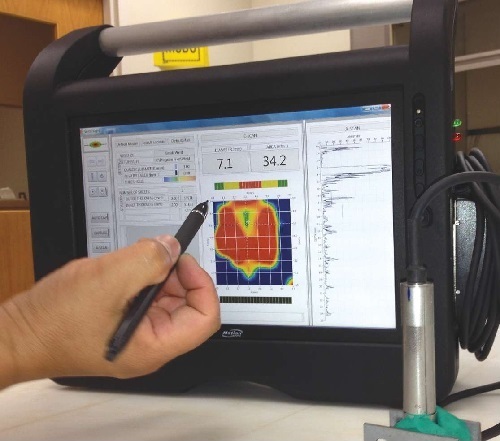 The EWI study demonstrated that the inspection system elaborates the MPA probe signals to accurately evaluate the effectiveness of component joints by showing weld nugget C-scan images in real-time. Quoting from the article: "This new NDI system not only reduces the need for destructive testing of spot welds in manufacturing, but also assesses the structural integrity of products with great cost-savings and efficiency." The article does not say if applications of this technique is considered for future automatic inspection. Interested readers are urged to seek the original article or to contact EWI for details. In his last Q&A Column on Stainless Steel, published in the March 2014 issue of the Welding Journal at page 20, our Reference Expert Damian J. Kotecki, gives an instructive example on how to tackle a complex question. The inquirer, exploring the request of his designers who suggested a change of material to seek higher design strength by using 17-7PH stainless in certain structures, asked if there are any compatibility issues by welding stiffeners of 17-4PH, from older surplus material, to new constructions. His question stemmed from his knowledge of the difference in the strengthening element, that is Cu in 17-4PH and Al in 17-7PH. Also the difference in heat treatment between the two materials required clarification. The Author starts by tabulating all chemical composition data for the two base metals and the two possible filler metals. He adds also the mechanical properties obtainable with standard heat treatments. He points out that 17-4PH loses much of its strength by increasing aging temperature from 900 to 925 °F, which is still lower than 950 °F that would normally be used for aging 17-7PH to its high strength level. The composed weldment (17-4PH+17-7PH) run through the heat treatment for 17-7PH would overage the 17-4PH components to somewhat less than the properties developed at 925 °F aging. However it may not be necessary to run the whole weldment through the (17-7PH) austenite conditioning treatment at 1750 °F. A compromise treatment at 1600 °F, followed by aging at 900 °F, may develop acceptable strength in both materials. Or, by adopting the standard treatment for 17-7PH, welded with AMS 5824 filler metal, one would have to accept that the stiffeners develop less than maximum strength. No welding incompatibility issues should be feared between Cu in 17-4PH and Al in 17-7PH. Interested readers are urged to seek the original article, for learning the correct approach to similar questions. with the latest date of Issue. Readers are advised to bookmark this note for future reference. All-weld-metal test specimen is a test specimen whose reduced section is composed entirely of weld metal. Brazing Procedure consists in the detailed methods and practices required to correct performing of a brazement. Coil With Support is a filler metal package type consisting of a continuous length of electrode in coil form wound on a simple cylindrical section without flanges. Double-groove Weld, in fusion welding, is a groove weld, welded from both sides. Electroslag Welding Electrode is a filler metal component of the welding circuit through which current is conducted between the electrode guiding member and the molten slag. Fused Flux in submerged arc welding, is a granular flux produced by mixing ingredients, followed by melting, cooling to solid state, crushing and sieving to the required mesh size. Groove Type is the geometric configuration of a groove. The standard types of groove welds are as follows: double-bevel-groove weld, double-flare-bevel-groove weld, double-flare-V-groove weld, double-J-groove weld, double-U-groove weld, double-V-groove weld, single-bevel-groove weld, single-flare-bevel-groove weld, single-flare-V-groove weld, single-J-groove weld, single-U-groove weld, single-V-groove weld, square-groove weld. Joint Welding Procedure describes materials, detailed methods and practices employed in the welding of a particular joint. In the past we reported on progress in direct and additive manufacturing by using Electron Beam or Laser Beam Welding. See PWL#077 (7) on Direct Manufacturing Process with EBW, PWL#106 (2) on Additive Manufacturing and Mid March Bulleting No.71 PWL#103B, Resources on Direct Manufacturing. Now two articles published in the March 2014 issue of the Welding Journal update readers on current advancements and progress. The first one, at page 32, describes a development study, performed by the Edison Welding Institute (EWI) of Columbus, Ohio, intended to explore problems and solutions for building titanium parts using gas tungsten arc welding (GTAW), with resistive preheated filler material wire provided from a side feeder, as an out-of-chamber freeform manufacturing process. The reason for this study is the lack of a well developed fully automated CAD-to-part additive manufacturing system that uses an arc welding process. The article points out that, while competing with subtractive traditional technologies for parts, because of its potential of faster, better and cheaper manufacturing, this technology, like any other, is not a solution for all applications. Selection depends critically on quality requirements. For titanium parts the process has further appeal for economic reasons due to cost and long supply times due to limited availability of required material sizes and shapes. Comparing arc processes with EBW, whose limitations stem from available chamber size and long pump down times, any free form building process not bound by such constraints has intrinsic advantages. The EWI development program, supported by Lockheed Martin, explored a few arc processes. For the production of a near net shape prototype part, GTAW with heated wire was selected. Thorough destructive testing was performed on the produced part demonstrating that it showed properties comparable to or better than those of Ti 6-4 ELI castings. The next step towards full automation would be to develop the software needed to produce the CAD-to-part capability. The second article, at page 40, mentions the universal diffusion of small 3D-printed plastic parts but quotes an authority asserting that "Large, high-value metal structures will be the holy grail for additive manufacturing practitioners". The authors, from authoritative knowledgeable positions, trace the past history of the developments of beam fused metal additive processes, supported by US National Laboratories, Agencies and Universities. It certainly took time and efforts, but the cooperative initiatives, spurted by the potential remarkable gains to be achieved by implementing innovative technology, and encouraging results, have placed the most advanced actors in this race in a solid position for assessing past achievements and for programming ever more ambitious goals. The application manager of an equipment manufacturer is quoted as saying "Through years of testing and development, the electron beam direct manufacturing process has proven to produce strong, high-purity parts". In the recent past, new cooperative efforts with four focused purposes have been launched: "The first is investigating new processes for joining armor. The second is blending (grading) metals to improve part life and performance. The third is discrete, on-demand metal part production using the EBDM process. The fourth is part repair and overhaul." The article ends with the concluding remarks of one of the directors of Federal Business Development at one of the involved Industries: "With additive manufacturing, new ground is being paved every day. If full potential is ever achieved, America's manufacturing industry will soar to new heights." Interested readers are urged to seek the original articles quoted above. The Pages of this month are updated and revised pages referring to similar subjects. The first, on Joining Galvanized Steels, deals with methods and materials used to join galvanized steels. Given the commonplace of this corrosion protected steel as a household items material, it is not surprising that special developments and process modifications were introduced, along the years, to join it. A special application, with its load of problems, is spot welding of galvanized steels for the production of car bodies. The other updated and revised page deals with three materials generally grouped together because of some common characteristics. It can be found by clicking on the link for Joining Lead Tin Zinc. A new page on Resources on Submerged Arc Welding Electrode Extension is published as Bulletin 94, that can be retrieved also from Welding Resources. As usual reader already know, a large amount of information is freely available in the Welding Advisers website. One can review the Site Map and the Index Page to find what one looks for. One can also perform a search, by typing the requested terms in the box that appears in almost every page of the Welding Advisers website: that will provide also links to pertinent articles of the Practical Welding Letter, now at its 128th issue (this page). ...how to perform microgravity tests? ...that US manufacturing is coming back? ...what is Welding like a girl? ... what a Vermont sculptor does? ...that Gas boom could bring 1,000 manufacturing jobs to metro area? 9.1 - Gage denotes (1) the thickness of sheet or the diameter of wire. The various standards are arbitrary and differ with regard to ferrous and nonferrous products as well as sheet and wire. (2) It can also be an aid for visual inspection that enables an inspector to determine more reliably whether the size or contour of a formed part meets dimensional requirements. (3) Or an instrument used to measure thickness or length. 9.2 - Hardener (1) for metals is an alloy rich in one or more alloying elements that is added to a melt to permit closer control of composition than is possible by the addition of pure metals, or to introduce refractory elements not readily alloyed with the base metal. Sometimes called master alloy or rich alloy. (2) For plastic materials, like Epoxy resins that may be reacted (cross-linked) by means of co-reactants, these are often referred to as hardeners or curatives. The cross-linking reaction is commonly called curing. 9.3 - Ideal Critical Diameter (DI) is the bar diameter that has 50% martensite at the center of the bar when the surface is cooled at an infinitely rapid rate under an ideal quench condition. 9.4 - Jaw Crusher is a heavy machine for the primary disintegration of metal pieces, ores, or agglomerates into coarse powder. 9.5 - Longitudinal magnetic field extends within the length of a magnetized part from one or more poles to one or more other poles and is completed through a path external to the part. 9.6 - Magnetic Pole is the area on a magnetized part at which the magnetic field leaves or enters the part. It is a point of maximum attraction in a permanent magnet. Send in both: your old and new addresses to Contact Us. HTPro, Volume 2, Issue 1 of March 2014 is an official publication of The Heat Treating Society (associated with ASM International) and is included in the March 2014 issue of Advanced Materials and Processes (AM&P). It can be downloaded in pdf format from HTPro. An article published at page 42 of the above downloaded publication, reports on development work performed at the ORNL (Oak Ridge National Laboratory) and elsewhere to study the influence of strong magnetic fields on induction coupled heat treatments. Driven by requirements of improving on traditional heat treatments, (based essentially on isothermal heating, whereby processing flows naturally from higher temperatures differentials), new developments in induction heating technology provide the capability to control internal thermal profile of parts, and permit to accelerate processing speeds producing enhanced strength and beneficial microstructural morphology in parts. The depth of heat distribution and the part’s internal heat profile can be optimized using computerized process control parameters. Short heating time, complex dynamic thermal geometric profiles cannot be recorded in detail, but can be mathematically modeled and simulated to help better understanding of the process. Coupling material science and simulation process engineering provides advanced understanding and review of viable alternative solutions to improve part performance. Technological limitations appear overcome by coupling high magnetic field to induction heating, providing advantages still to be learned for practical applications. Advancements in developing the next generation of novel structural and functional materials can be potentially achieved by using induction thermal high magnetic field (ITHMF) processing, permitting major improvements in material performance. Visionary applications in a number of different areas appear reachable once this new technology is fully developed. Another article, published at page 44 of the AM&P quoted above, and readable from the publication downloaded above, reports on recent initiatives to provide Analytics modeling and Optimization by using the huge amounts of data generated and recorded while performing industrial heat treating processes. The article reminds that characteristics of input materials, process parameters and treated product quality are routinely collected in modern operations but mostly remain unused. Only in cases of audits and troubleshooting the data are analyzed to determine the causes of inferior results. The authors point out that, by initiating a proactive process in a closed loop where manufacturing data were synthesized with physics and data based modeling approaches, insights could be gained for process optimization and control in real time. "Physics-based models for heat treating operations incorporate mass and energy conservation, laws of heat transfer, metallurgical thermodynamics, and chemical reactions and kinetics. Some important physics-based models with respect to carburizing include thermal models, diffusion kinetics, quenching models, residual stress, and distortion models. A judicious synthesis of these two approaches and modeling methodologies is far more effective than focusing on individual components of the process." A few Case studies are reported. The first, on Coil batch annealing, generated three practical recommendations that permitted reduction in rework and downgrading, and also significantly reduced the plant’s specific energy consumption. The second, on Automated coil batch annealing, after having ascertained that the thermal model used in the control system was very conservative in estimating heat transfer across the coils, promoted the development of an appropriate thermal conductivity model. Nonisothermal models were used to create transfer functions for the process derived from the control system to modify the control algorithms. This approach improved yearly productivity of the integrated steel plant by 9%, with a considerable reduction in specific energy cost. The third on Batch Carburizing referred to a heat treating operation of 12 quench-sealed furnaces for transmission components such as gears and shafts. In this case the huge amount of recorded data was not used in real time for process control. A thorough analysis of the data clarified the issues and permitted the building of a robust mathematical model that helped in optimizing parameters for improved productivity. The article summarizes the results that demonstrate the effectiveness of the approach and the possible gains. It appears however that "the great limitation in this area is finding the technical talents with the necessary level of expertise". Readers are urged to download HTPro, as indicated above. I need advise in this regard. Is there a company who can help us weld the wires? 13.1 - What would you answer to the following question? "Hi, I sent my horsebox in for welding and the guy has burnt the cab and smoke damage in the living. He has admitted liability but he has no insurance. 2 - And what would you make of this one? "Metals we working with right now have limited weldability data, some times too general. Useful tips from a man with experience like Yours would really help." 14.4 - Welding Education, Skills, and Certifications Conference. July 23–25. Ivy Tech Community College Indianapolis, Ind. Can you think of Business without Boundaries?